Access to clean water can be a crucial issue for many rural communities in developing countries. The largest sources of water pollution are from inadequate treatment of human wastes and poorly managed industrial and agricultural wastes. Specifically, the contamination of water sources by synthetic organic compounds (SOCs) such as pesticides, pharmaceuticals, and fuel compounds is a growing problem worldwide as these chemicals can bio-accumulate in the human body and cause cancers and other diseases. There are often few low cost, sustainable and appropriate treatment technologies available for SOC removal in rural areas. Activated carbon (AC) is considered the best available technology for the removal of SOCs in water in rural areas, however AC manufacturing processes are sophisticated and usually cannot be replicated in these rural areas without large infrastructure investments. The Engineering for Developing Communities Program at the University of Colorado-Boulder (United States) is currently studying low cost approaches to water treatment using biochar as a surrogate for AC. 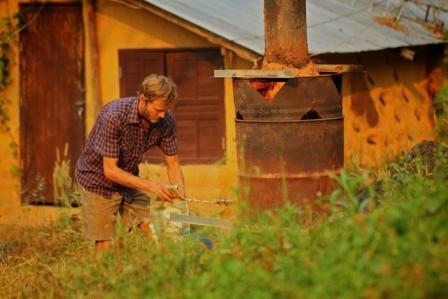 Josh Kearns, the director of the biochar research consortium with the University, is producing biochar with Top-lit Updraft (TLUD) gasifier stoves and small kilns along the Thailand/Burma border as part of his research. Since 2009, Kearns has been working with water treatment specialists at the University of Colorado-Boulder to test the effectiveness of chars produced from traditional village kilns. Why Use Gasification over Traditional Kilns to Produce Char? Kearns began work with TLUDs and water filtration in late 2006 while traveling and working with farm communities in northern Thailand. There he witnessed firsthand the effects of agrichemical-intensive farming practices on water quality and public health, and the urgent need for sustainable, affordable, and locally controlled water technologies. This prompted him and local colleagues to form Aqueous Solutions, a US- and Thailand-based non-profit organization. During his trip in 2006 he also learned the art of traditional charcoal making from village colliers in order to generate his own representative chars for laboratory study. Firsthand experience making dozens of batches of charcoal with traditional kilns taught him that it is indeed difficult, dirty, and unpleasant work. Kearns says he has tremendous empathy for those who have made their living as charcoalers–the long hours and days tending the burn, while breathing particulate matter and noxious gases. Thus he is equally as enthusiastic about advancing environmentally sustainable and user-friendly char production technologies as he is about the potential for chars as low-cost adsorbents in water treatment. For water treatment purposes, the best char has substantial micro-porosity and surface area for the effective uptake and binding of SOCs. In production, the feedstock needs to reach high enough temperatures (650-950 °C) to remove the naturally occurring tars and oily components of the biomass while converting the remaining carbon-rich material to a graphite-like structure. Both traditional kilns and gasifiers (TLUD-type) are able to produce a good product for filtration. However, with traditional charcoal production so resource-intensive and polluting, Kearns has been working with gasifiers run on agricultural and forestry residues which emit far less atmospheric pollution, and are able to use the waste heat for a variety of applications including cooking and drying crops. How is Water Filtered with Char? Char (whether AC or biochar) filters work through the process of adsorption. As a background, adsorption, is the surface interaction between dissolved materials and the char, and is distinct from absorption, which means “to soak up” or “to take into.” For water treatment, contaminants diffuse into char pores (absorption) where they bind to char surfaces (adsorption). As noted, the large porosity and high surface area of biochars provide many reactive sites for the attachment of dissolved compounds. These reactive sites can also bind non-problematic dissolved organic matter present in all natural waters as well as the targeted hazardous contaminants. 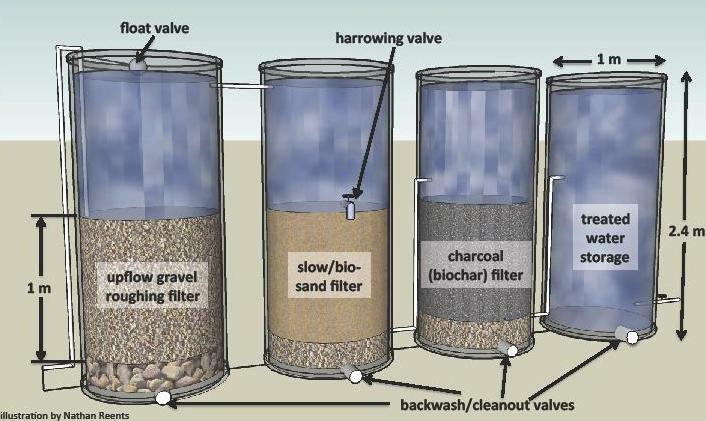 This organic matter can clog the char pores and make it less effective; to mitigate this occurrence, a filtration system uses gravel and sand filters to remove a large portion of the organic matter from the water before it encounters the char. The idea is to achieve a high level of treatment prior to the char filter, to “save the carbon” for removing the SOCs. Biochar filters do differ from Activated Carbon filters in a couple key ways. Local biochar is ideally made from agricultural and forestry residues and/or sustainably harvested renewable woody biomass whereas most commercial ACs are made from (nonrenewable) coal. Both local biochars and ACs undergo a carbonization step where the feedstock is heated to several hundred degrees C under restricted oxygen. Commercial ACs are subsequently “activated” in an additional step that requires processing not usually available in rural areas. 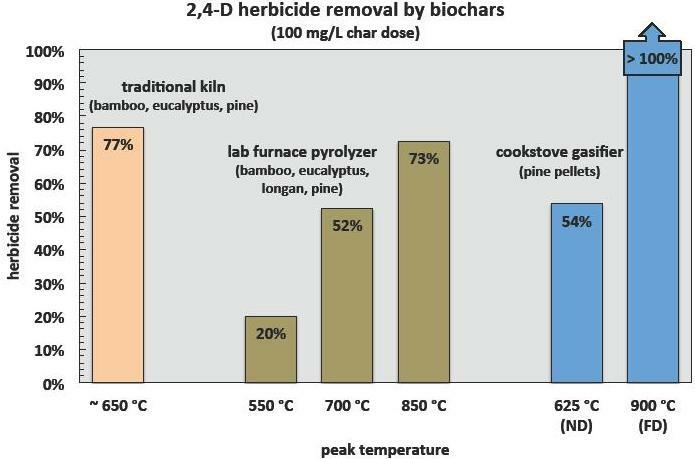 Compared with AC, locally-produced biochars may contain substantial proportions of incompletely carbonized tars and oily compounds (especially if the biochar is produced at a temperature below ~ 600 °C). Local biochars may also contain a high proportion of ash depending on the feedstock (such as rice hulls). Since the local biochars are not “activated” and may contain higher proportions of ash or residual tars and oils, they may not have the same water filtration capacity as commercial ACs, and so the water filtration design will use a greater amount of biochar as compensation. The team has just published a how-to handbook for making enhanced water filter biochar for use in decentralized, small- and intermediate- scale water treatment systems. They are also producing a video to accompany the handbook showcasing how to construct and operate a 200 L gasifier for making water filter biochar. The target audience for the handbook is people with some technical understanding but mainly practical competence, including WASH development workers, field engineers, local village technicians, international sustainable development agencies, and NGOs. Kearns’s idea is that people can read the article, watch the associated video, and make their own enhanced water filter biochar and incorporate it into a multi-barrier treatment system using widely available and inexpensive materials. For more information on this project, please contact Josh Kearns or see the Aqueous Solutions website at www.aqsolutions.org. October 2012: for a new article on this work, please see http://www.wcponline.com/pdf/October2012Kearns.pdf. 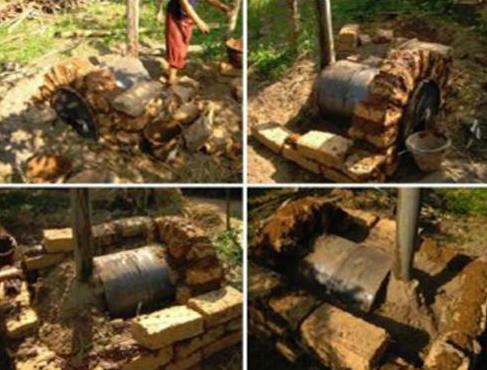 Traditional means of producing charcoal in Thailand for filtration; courtesy of Josh Kearns. Attaching a temperature probe to a TLUD producing biochar; courtesy of Lyse Kong. Herbicide removal by biochars; courtesy of Josh Kearns. Water filtration by biochar system; courtesy of Nathan Reents.